The beauty of a festival like The Asian Film Festival of Dallas is that since I'm not as well as versed in the Asian cinema culture, I know I can just randomly go into a movie without any preconceived notion. Imagine my surprise when I walked into an this Korean crime drama. What really interested me was the subject matter of the informants in the Korean police's payroll, and the morality of their lifestyle and choices. What followed was a very enjoyable, albeit not groundbreaking, crime story that has a lot of great, tense moments. The story starts of with Detective Don Lee (Cheung) ordering an unsuccessful sting operation on a drug deal being spied on by his informant. 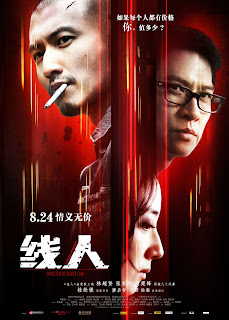 Even though the drug dealer they were trying to apprehend gets away, and his informant is viciously murdered, Detective Lee gets Head Inspector and a year later, must enlist another informant, this time in the form of recently released inmate Ghost Jr. (Tse) one of the "criminals with a heart of gold" types, to help with a jewelry thief that just arrived in town. The highlight of the movie for me was the subtleties of the character, Lee. His character is deeply troubled in the year since his last operation, which is something that slowly unfolds throughout the movie. There's a very interesting scene where he is teaching other detectives on how to use informants and lays down the ground rules, and just like with all "movie rules", he slowly breaks them in his partnership with Ghost Jr.
As the story of Ghost Jr.'s infiltration of the gang continues, you see how much danger he gets put in by way of Detective Lee's actions. When the police begins to trail Barbarian, the ringleader of the gang, the whole gang gets searched and tensions run high, and during these scenes is when you see Cheung's acting abilities shine. When in the presence of other gang members, he's so quiet, he mostly acts with his eyes, and it's very impressive. When the story kicks into high gear, there are some well shot action and chase scenes throughout the slums. I know it's cliche, but I always enjoy seeing action scenes and fights where there's not a .0001 cut, and I can tell what is going on. If there's a place where the story falters somewhat is in its somewhat formulaic turns. Things like the developing romance between Ghost Jr. and Barbarian's girl, Dee, to the way things pan out towards the end of the movie. And even with that, it was a very good version of a crime drama that you might have seen before. I'd hate to compare it to INTERNAL AFFAIRS or THE DEPARTED, be this movie is more interesting at times, but it's similar because of the fact that it is more of a character study than just a thriller. Overall, I'd highly recommend this for any fans of cop dramas, heist movies or just a damn fine movie.